As you know, I’m taking Me: The Abridged Version over at Big Picture, but putting an art journal spin on it. I desperately needed a kick in the pants when it came to art journaling, and I thought this would be a perfect way to not only start my art journaling, but have content for it (that way I can sort of play around with design and technique rather than worry exactly *what* to journal about). Our very first assignment was to create a Tag Book for our pre-project writing. Cathy Z., our teacher, gave us a digital template but I just made my own out of a stack of index cards, my watercolor spritz paints, alphabet stamps (from Purple Onion), and my washi tape. Now I’m filling each page, and some letters are easier than others. Next I’ll start working on each journal page- first the foundation (a page for “A”, a page for “B” and play with techniques on each page), and then filling them with the content I’m collecting in my tag book. Beautiful! I love that you are combining different interests into one thing…that’s what we are..a big mix of different qualities! 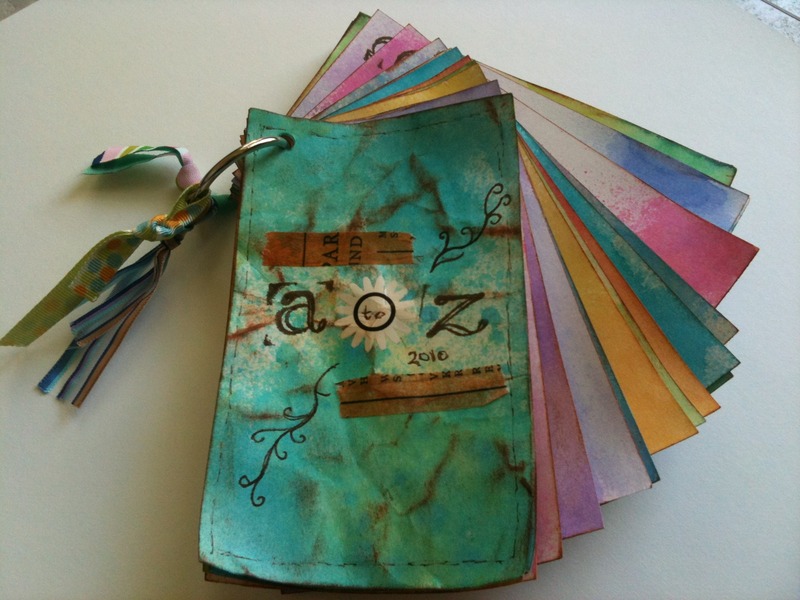 I love Cathy’s A-Z idea and also making a minibook myself…was for my birthday, but running a bit late on that! Looking forward to seeing your progress! Love this! The colors are so pretty. Nice idea to concentrate on the technique aspect of journaling. Sometimes the content evades me as well, and I’d rather just play with colors and line with no pressure to add anything verbally profound. 🙂 I have a fondness for the miniature, so this tiny journal appeals! Enjoy the project Chel!